Hello gamebookers! This is a post about skill tests and dice rolling. Having a random element is adds some tension to books and allows the thrill of not knowing exactly what is happening. After asking whether Cymerian should be diceless or not, the overwhelming answer was to have dice, and I agree with it. I will be using dice. However, I can't just shove in dice rolls and coin flips all over the place and let people get on with it. I need to make sure that when I make a dice roll, there is a reasonable chance of success that makes rolling the dice worth it (isn't it tedious when you have to fight a skill 5 opponent with a skill of 12 or depressing when you have to fight a skill 12 opponent with a skill of 1?). 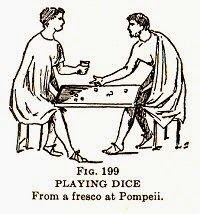 rolling a dice is not a free action - too much of it for no good reason will be tedious and break from the immersion of the book. So for that reason, I need to make sure that every dice roll has a degree of tension - a feeling that both success or failure might happen no matter how high or low the difficulty is. So the first question I have is - what is the lowest probability of success or failure that still keeps the tension? Is it worth rolling a dice if there is a 95% chance of success? Do you still get a thrill if there is a 10% chance of success? This leads on to Cymerian. 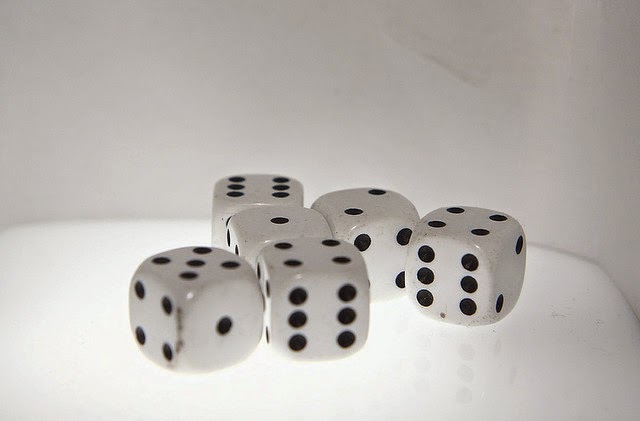 The ability tests in Cymerian involve involve rolling 4 dice to get equal to or above a number. If you have points in the relevant ability, you can reroll a number of dice equal to that ability score. The reason I did rerolls instead of increasing skills is that I intend to release a lot of Cymerian books that I want to be a challenge for characters of all levels of experience. Having rerolls means that all tests would fall in the range of 4-24, meaning that no matter how good or bad you are, you still have a chance for success. the Rising Sun because all of the tests and opponents were way above anything they could do. 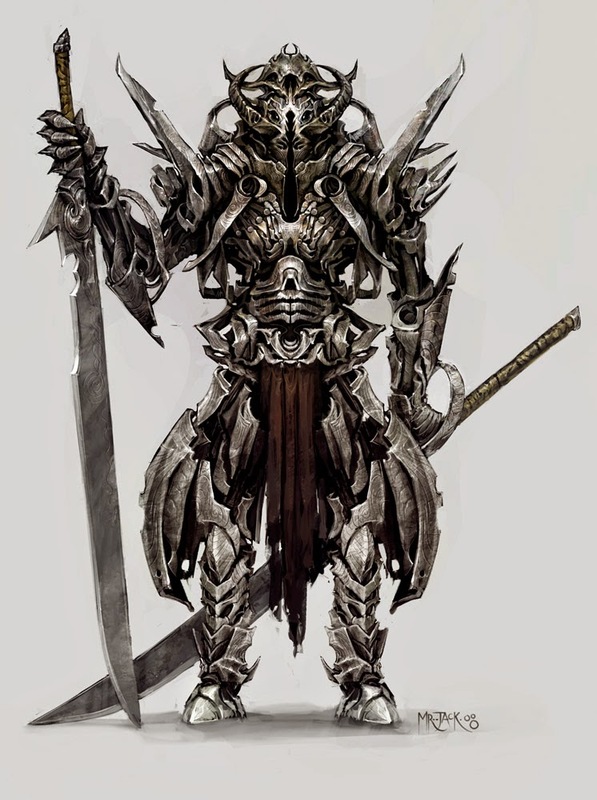 Similarly, a level 6 character would just steamroll straight over any challenge set them in the War torn Kingdom. This is because of the system. In Fabled Lands, when a test is performed, you roll 2d6 and add it to the relevant skill to get over the difficulty of the test. As characters get better, their scores increase. Having a roguery of 6 might be good in book 1 where you have to beat tests with a difficulty of 9-12, but it might be rubbish in book 6, where the difficulties are usually from 14-16. Also, in some cases, some tests will become impossible. Also, charactesr who start in book 6 have their highest ability score at 8. If they head over to book 1, success is certain, taking away the tension. Tunnels and Trolls solos have the same problem. They are only appropriate for delvers of a particular level and sometimes they cannot use the magic spells that they may have. Which is why I went for rerolls instead of getting a higher number. A difficulty of 17 with 4d6 might be hard, but it is possible for everyone whether they have 0 rerolls or 3. So rerolls it is then. However, I was fiddling around on Anydice, and I realised that 4d6 might not be perfect for this system. So, I was wondering how many dice would be best with this system. I have an idea, but I want to ask you, my wonderful readers. So, I will show you the probability distributions for 1d6-6d6 with the good and bad points of each one. Just to tell you - output 1 is the chance of getting a score with 0 rerolls. Output 2 has 1 reroll, output 3 is 2 rerolls etc. 1d6 does have a good distribution, but I would be worried at lack of 'wiggle room' for difficulties. My minimum difficulty would be 3, but I might not be able to find enough difficulties from 3-6. The more dice you have, the more 'wiggle room' you have to make some rolls slightly harder. However, the more dice you have the smaller the effect of one of the rerolls. I think that 2d6 is in danger of not having enough 'wiggle room', but it is still relatively simple so its simplicity might win out. More wiggle room, but maybe 3d6 is too many to roll with one roll? 4d6 allows for more wiggle room and also makes it possible to have items give rerolls. Using these distributions, I could introduce rules so that items could give rerolls on top of abilites (which I would have to do as abilities will have a lot less effect, the more dice they have). So this would introduce more complexity to the game, and maybe it would reduce tension as 1 dice reroll has less of an effect. so basically, the more dice the less effect increasing difficulty has and the less effect 1 reroll has. Where do you think is the sweet spot? I have an idea, but I'm not going to say. The discussion about when die rolls are worth it is interesting to me, because I started thinking about that sometime after (unfortunately) my first boardgame had been published. It might be slightly different, but related. I find it a bit annoying when you lose because of an enemy 16.7% hit, or because you fail a roll that had only a 16.7% chance to fail, because in both those cases any reasonable player will plan for success/failure. If you have a hit-chance not too far from 50 % (but how far?) you will expect both outcomes and unless the situation is desperate you will plan for both, but if you plan for every 16.7 % probability of going wrong you will lose because you will play too defensively. So I think I made up my mind to keep all probabilities closer to 50 % in the future. Never saw any serious discussion on this topic though. I like unexpected unlikely outcomes though. I think they need to exist in addition to normal success/fail, for instance having a chance of a critical hit. So you can still plan for success/fail and if something extra good or bad happens that is very unlikely and affects the game a bit that adds some entertainment value, but does not usually completely wreck the game. Not 100 % sure how all of that applies in a gamebook/rpg. About the rerolls and that, I'm not a big fan of probabilities that are difficult to calculate quickly. That is why I don't like rolling lots of dice or rerolls. Just rolling 1d6 or 2d6, possibly combined with a results table, makes it very easy to see how good my chances are. My own inclination would be to go with 3d6. The human brain likes threes, largely because that's the limit of how many items we can hold in our head at the same time. Besides, it seems to strike a good balance between simplicity and wiggle room.